The top half getting stuck on something because if I take out the top parts it will close fine. How far it will close. And also when I connect the battery nothing working at all so I cant shoot it to reset the gears if that's the problem. The fuse is blown I think does anyone know what amp rating I should get? DO NOT RUN THE GUN AS IT IS !!!! Ere - just noticed on your pic - where is your ICS forward assist AR latch releasey dooberry whatsit at back of sector gear opposite the spear gear ??? presume this gun was second hand or missing the ICS releaser doobery mechanism ???? did it come off/fall into box causing lock up & blow fuse ??? This gun brand new today am I missing a part? I am not sure what missing? I hooked it up quick without the fuse and got the gear into place so it closes now. Then I got some more fuses tonight but they always blown when I try to fire. I think it could be the tamiya to deans adapter I am using but I can't be sure as its the only battery I got till tomorrow. semi should of done it but seems like it might have run on a bit - well quite a bit - you using 11.1v or some 35c 7.4v or something ??? The spring tension on the new ones is activated when you put on safe if that what you meant. I don't if its working right without power though. I was going to wire up the gun with a deans connection after I made sure it was working fine using the adapter. So I got adapter from ebay...lol and the red and black did not match up so I and redid them wires and still its blowing fuse. I am going to buy a normal tamiya battery tomorrow so I know 100% it's working or not. I found my other battery that is a 9.6 and the gun with the top half off was working fine. So now I know the gun working so I put on the deans connection for my 7.4 and the fuse blown again. Can a battery blow the fuse? I am thinking something wrong with the battery now. A battery can blow a fuse. The fuse is designed as a week point incase of a power surge. I had a problem with a Nuprol Lipo in my Krytac LVOA. Every time I attactched it and tried the gun it blew the fuse. The other Nuprol Lipo I brought with it worked fine. Not sure why the other Lipo didnt work, maybe fecked inside or something. I'd say don't use the 7.4 as there is obviously an issue with it. Well, if you did solder it backwards, then it will blow the fuse. On the mini tamiya the round one is the positive. by all means try some diagnostics n stuff but if the gun is f*cked then send it back !!!! NO I AM NOT SAYING DO THIS - just saying not seen this from any gun or motor manufacturer ??? I had an ICS just die on me but seperated two halves - ran box a few cycles - thought thats is working, put it back together and gun ran fine ??? The motor itself "might" have a short in it - I'm still wondering how/when they changed the release button to the WE safety AR leases system, so still have a tiny bit in my mind did owt fall off or come loose ??? I think the gun working as I done a quick test with the 9.6v battery lower half for a few turns and worked fine. Then thought it was the adapter was doing something funny so I stupidly got the soldering iron and connected the dean connection up hoping that be it. But my deans battery does not work still. So I have messed up my warranty now I think connecting the deans but Monday when I get a new battery I will know for sure. This what I did after testing the 9.6v working battery. wtf did you buy this from ???? but the AR release & how dry the box appears to be in pics is raising some questions as to where this gun came from ??? It is a weird one but I keep looking at it and keep finding more wtf's ??? 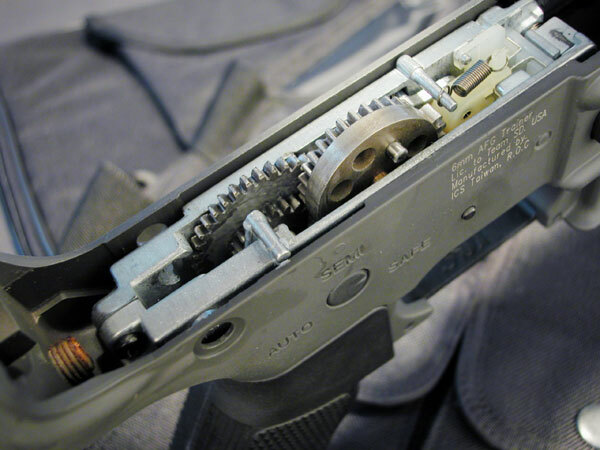 Dont think the new ones have AR release latch anymore as they they have the spring release on the safety. Looks like plenty of grease as ICS use a white grease that I can see in the pics. Gear position is something you have to be a bit careful of when splitting as the UK ones can overspin a bit because of the m100 spring. Make sure the bolt cover is all the way home before splitting. If you bought it from firesupport they should be ok with you changing the connectors. If it works ok with one battery but not another then its the battery that is the problem. Thank you all I bought it from red one airsoft The guy who runs it seems very good and I am sure nothing bad from him. Had to get this item ordered in as they did not have it instock so its 100% new. Monday I will have to get one and hope it works. Big lesson learned don't mess with stuff lol. If its broken I think I have to pay someone to fix it for me as I don't think the shop can do much if I changed the connector and that's my bad. Bit confused right now but I try do step by step what happened lol. I went to my local shop to get another battery and the tech guy in there had a quick look while I was paying. He put his finger on the gears and says it very tight and could be jamming up. He could do a service for £40 and check it over if it don't work. I then tested the 9.6v battery gain and it was working like it did before. I then tested the 7.4v deans battery that has never worked before and is now suddenly working fine ????? Now all batteries I put in are working perfect and been through 10+ mags shooting fine. and its shifted postilion so its not making contact right now. I have a few questions if anyone could help me as the only other aeg I have owned was the JG AUG and bit different internals to the m4. (1) On the blowback unit should always return the same position ? (2) When shooting I feel the motor in the grip like its moving is this normal? If the Motor feels like it is twisting then that would be a good indication that the gearbox is possibly over shimmed/too tight. It feels like its moving up and down but I don't know what you would call normal. I will take it to the shop tomorrow see what they say is my only option I think. Right the tech at the shop had a quick look and done some tests for me. He said its could of been tight shims and that's why the 9.6v could unstuck the gears where the 7.4 just blown a fuse. The motor not getting warm and what I was feeling is normal. Its shooting at 315-330 fps. Just like to say thank you all for your help and advice it's appreciated.